Barbara Deming (1917-1984) was one of the most dearly loved and respected civil rights and feminist political activists and essayists of our time. Born in New York City in 1917 and educated in The Friends Meeting House Quaker School in N. Y., she went on to study literature and drama at Bennington College and earned a Master’s degree in Drama at Case Western Reserve University in 1941. Deming began her career as a poet, professional writer and film critic. After becoming interested in Gandhi during a trip to India in 1959, she went on to become a leading thinker in the non-violence movement, arguing for a strictly secular approach to non-violent resistance, with no religious basis. During the Second Wave of feminism, she became a leading thinker and activist with a deep commitment to fighting for the rights of women and the betterment of their lives. In the 1960’s, Deming joined demonstrations against Polaris submarines, walked on the San Francisco to Moscow walk for peace in 1962, and attended the International Peace Brigade in Europe. Protesting atomic bomb testing at the Atomic Energy Commission led to her first experience with jail, at the Women’s House of Detention in New York City. She marched in the Nashville to DC bi-racial walk for peace, and in 1963, joined black activists in Birmingham, Alabama and Georgia, as well as attending the House Un-American Activities Committee hearings. In 1964 she joined the 2800-mile Quebec-Guantanamo walk for peace and freedom, a racially integrated protest over US actions in Cuba. During a portion of this march in Albany, Georgia, she was jailed and recorded much of her experience in her book, Prison Notes. In 1965-1967 Deming traveled to North and South Vietnam to protest the war. She went on to march for feminist and gay rights causes and in 1984, in spite of failing health, once again was jailed on a march through Seneca Falls, organized by the Women’s Peace Encampment, to protest the deployment of Cruise Missiles to Europe. Deming experienced her first lesbian relationship when she was 17. From 1954-1972, she partnered with Mary Meigs, and later, the Quebecois writer Marie Claire Blais, and from 1976 until her death in 1984, Deming lived with her partner, artist Jane Verlaine in the Florida Keys. At every turn, she wrote about how important it was for women to support the art of other women. After her death in 1984, Money for Women, one of the major beneficiaries of her estate was renamed Money for Women/Barbara Deming Memorial Fund. Without Barbara Deming’s generosity and commitment to supporting the work of feminist artists with every dollar she could spare, The Fund would not exist. Sugarloaf Women’s Village https://www.sugarloafwomensvillage.com/Welcome.html was founded in the mid-70’s by Barbara Deming and her life partner, Jane Verlaine (artist, poet, radical activist, author, and defender of women). It grew in the early 80’s when Blue Lunden and Sky Vanderlinde joined Barbara, Jane, and the other women who were living here then. Barbara died in 1984, leaving the property to Jane, who died in 1992, leaving the property to Blue. 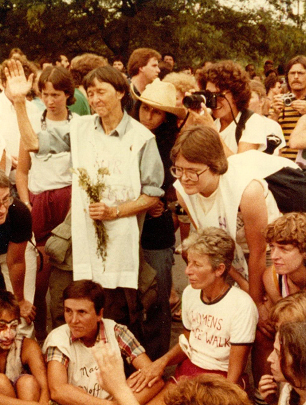 Before Blue’s death in 1999, she created the Sugarloaf Women’s Land Trust, dedicating the property to all lesbians. Prison Notes , New York: Grossman Publishers, 1966. “On Revolution and Equilibrium." Liberation February 1968. From the collection: ed. Staughton Lynd and Alice Lynd. Nonviolence in America: A Documentary History, Revised Edition. Maryknoll, New York: Orbis Books, 1995. Running Away From Myself; a Dream Portrait of America Drawn From the Films of the Forties , New York: Grossman Publishers, 1969. Deming, Barbara; Berrigan, Daniel; Forest, James; Kunstler, William; Lynd, Staughton; Shaull, Richard; Statements of the Catonsville 9 and Milwaukee 14 Delivered Into Resistance The Advocate Press: 1969. Revolution and Equilibrium , New York: Grossman Publishers, 1971. Wash Us & Comb Us , New York: Grossman Publishers, 1972. We Cannot Live Without Our Lives , New York: Grossman Publishers, 1974. A Humming Under My Feet , London: Women's Press, 1974. Remembering Who We Are , Tallahassee, FL: The Naiad Press, 1981. We Are All Part of One Another: a Barbara Deming Reader , Barbara Deming, Jane Meyerding, (Editor), Philadelphia: New Society Publishers, 1984. Prisons That Could Not Hold , Barbara Deming, Judith McDaniel, Joan E. Biren, Sky Vanderlinde, (Editor),University of Georgia Press, 1995. I Change, I Change , Poems by Barbara Deming, edited and with an introduction by Judith McDaniel, Preface by Grace Paley, New Victoria Publishers, 1996. This is available online but not at Powells.